Skiing is a favorite outdoor activity in the Smoky Mountains. The slopes were open a record-breaking 111 days for skiing and snowboarding in 2013-2014. 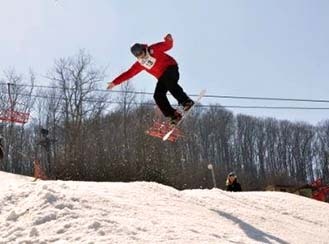 Ober Gatlinburg offers 9 trails and 4 lifts for your skiing pleasure. Terrain is available for all abilities, from a beginner experiencing the joy of snow sports for the first time, to a seasoned expert hitting the moguls and terrain park. A state-of-the-art snowmaking system begins making snow as soon as the temperatures drop. Skis and snowboards are available for rental. The ski resort is accessible from an aerial tramway station on the Parkway in Gatlinburg. You may also drive your vehicle to the resort by turning onto Ski Mountain Road in downtown Gatlinburg.